The latest and final member of Hyundai’s i30 range has just taken to the streets – and you won’t miss its striking, bold design. The clue’s in the name – the i30 Fastback. In an era of crossovers and suv models the fastback is a rare beast and it’s a bold move on the part of Hyundai to launch one. But there’s no denying that while the i30 hatchback and estate are best-selling models the new Fastback is the one with the looks. The sharply angled roofline tapers dramatically and cleverly ends in a neat little rear spoiler which adds to the flair. And while the rakish shape might mean less height there is still plenty of headroom to ensure rear seat passengers travel in comfort. In fact the Fastback is 30mm lower than the five door model and 115mm longer. At the same time the suspension has been stiffened by 15 per cent to ensure a more dynamic ride – but not at the expense of passenger comfort. Lift the tailgate and you will see a sensible sized boot capable of taking some 450 litres of luggage, increasing to 1,351 litres with the split rear seatbacks folded down. Despite the smaller back window compared to the five-door model rear vision is more than adequate although there were times when I wished there was a rear wiper fitted. The interior is smart with easy-read dials and an eight-inch touchscreen set high on the dashboard so it’s easy for the driver to focus on quickly, although there is little to break up the plethora of black trim. The Premium model is well kitted out with features which include satellite navigation, heated front seats, a blind spot warning system, rear cross traffic alert and keyless start as well as keyless entry and exit. It’s powered by a 1.4-litre turbocharged petrol engine which offers plenty of flexibility thanks to almost diesel-like low end torque, achieved by integrating the turbo in the exhaust manifold. On the road the Fastback offers a supremely comfortable ride and is impressively quiet. It has a nice slick, smooth-to-use six speed manual gearbox and an on-screen indicator suggests when to change up to save fuel. Over a week of driving I managed to average 45 miles per gallon which is close to the official figure of just over 49mpg. The Fastback corners well with no roll to speak off thanks in part to its lowered suspension, but it’s not a hot hatch rival nor is it designed to be. But it is a car that looks good, does everything you ask of it efficiently and has enough on-board kit to ensure contented motoring, even if it does carry a £500 premium over the five door. 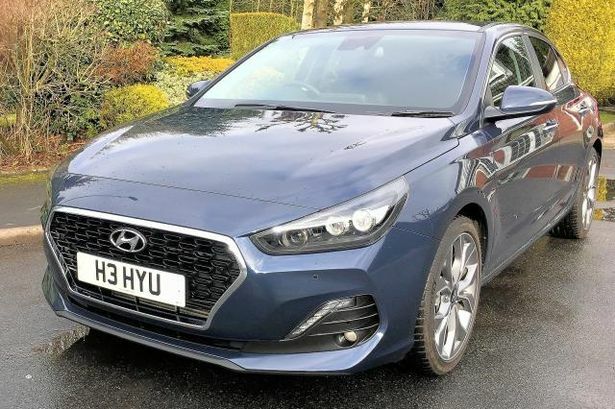 Add to that Hyundai’s famous five year warranty and even though it’s likely to be the niche model of the i30 range - and therefore with fewer sales than its siblings - it’s certainly going to be the most desirable. Mechanical: 140bhp, 1,353cc, 4cyl diesel engine driving front wheels via six speed manual gearbox.